WoTM - Remhoogte ‘Bush Vine’ Pinotage 2015. 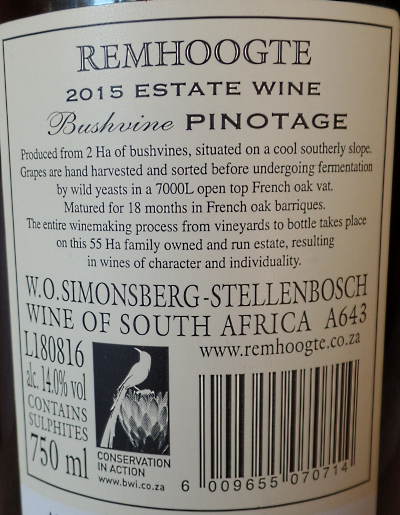 My Wine of the Month for August is Remhoogte ‘Bush Vine’ Pinotage 2015, an estate wine from Simonsberg-Stellenbosch. I’ve not had many Remhoogte wines but I’ve enjoyed all that I’ve encountered. The estate is on the R44 just north of Stellenbosch and as I recall you can observe zebras in the neighbouring game park from the tasting room. Unfortunately their wines don’t appear to be available where I live and I brought this bottle home with me from my Cape visit earlier this year. It is robed with a garnet and sweet fruit with underlying power and an oak creaminess. I can’t find any details of this wine on their irritating website but according to the back label this is hand harvested from 2 hectares of bush vines. Wild yeast fermentation is in 7000 litre open topped French oak vats and the wine aged for 18 months in French oak barriques. 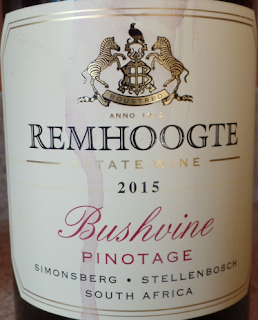 Delicious and a perfect example of how classic Pinotage should be. The panel of judges were Neil Ellis of Neil Ellis Wines (chair), wine educator and consultant Nomonde Kubheka, winemaker Corlea Fourie of Bosman Family Vineyards, Francois Rautenbach of Singita Premier Wine Direct, viticulturist Stephan Joubert of Douglas Green Bellingham (DGB). There were 147 entries in the 2017 Absa Top 10 Pinotage competition, and with around half of the 21 finalists and six winners from Stellenbosch wineries. It was a first time win for Stellenbosch Vineyards. The other nine have multiple wins under their belt, with Kanonkop Estate making 2017 a record twelfth win. For the first time producers were invited to also submit entries in a Museum Class for wines 10 years and older.